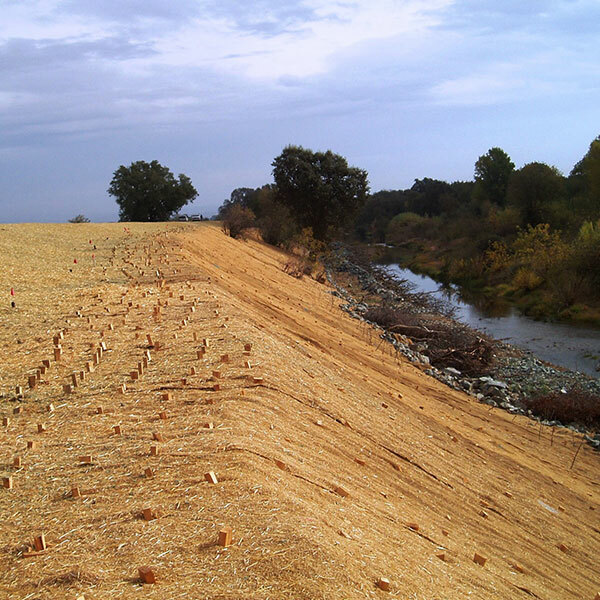 Erosion control blankets prevent surface erosion while accelerating vegetation establishment. They also temporarily stabilize and protect disturbed soil from raindrop impact and surface erosion. They increase filtration, conserve soil moisture, and decrease compaction and soil crusting. Erosion blankets are machine produced mats of biodegradable mulch such as excelsior, straw, coconut fibers or a combination thereof. These materials are evenly distributed on or between photodegradable polypropylene or biodegradable natural fiber netting. 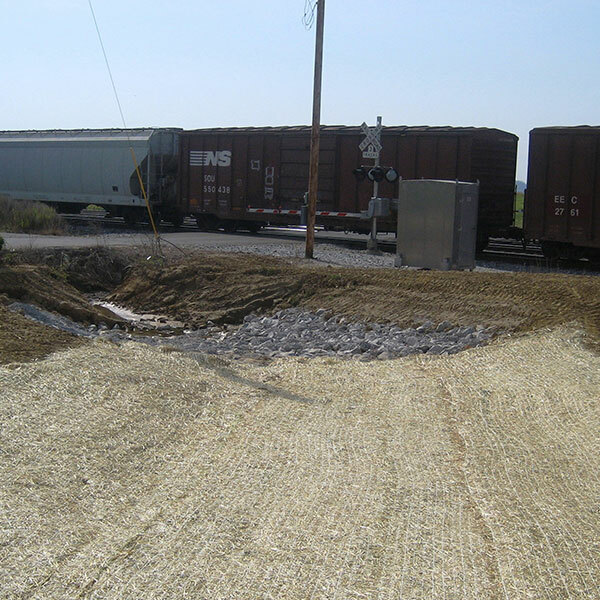 Temporary erosion control blankets are manufactured from natural fibers such as straw or wood excelsior. Photodegradable poly netting is stitched on one or both sides. They provide short-term rainfall/rainsplash protection of slopes. The blankets are also effective as a channel liner in low risk/low gradient scenarios where vegetation establishes quickly. 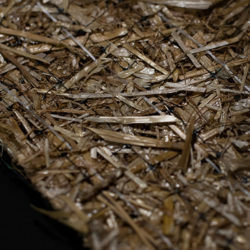 All natural rolled erosion control blankets are manufactured from straw, wood excelsior or coconut fibers. 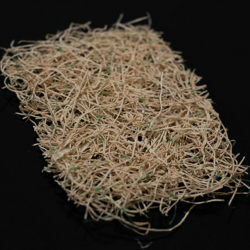 Their fiber matrix is confined by a biodegradable, jute/scrim net on top and bottom and then mechanically (stitch) bound with a biodegradable cotton thread so that they are completely biodegradable. 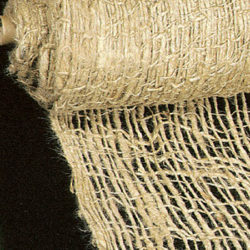 Jute matting is an all-natural erosion control blanket that consists of unbleached, undyed natural jute fibers woven together to produce a mat of uniform openings. It is also lightweight and highly absorbent. The open weave of the matting hugs the soil and holds the vegetation in place while giving the roots a chance to establish. 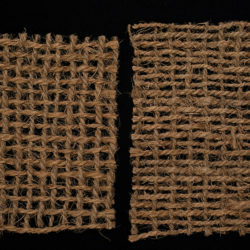 The jute also biodegrades completely in two years. This provides organic matter and nutrients for the soil. Coir fiber mats consist of pure coir fiber woven into blankets with specific weight, strength and open area. It also has one of the highest durability and tensile strengths of all natural fibers. Coir is suitable for the most severe erosion control problems, such as steep slopes and high velocity flow channels. It also effectively stabilizes stream banks and shorelines. Its high flexibility easily conforms to the soil contour while creating a tight bond. This woven feature allows planting directly into the soil through the blanket without cutting it. Coir fiber has the natural ability to absorb and retain water so it creates an ideal microclimate for vegetation growth. Thus, the mat’s extended longevity allows for full vegetation establishment. After years of effective erosion control and vegetation anchoring, the mat then bio-degrades and returns nutrients back into the soil. Available in 400, 700, and 900-gram weights. 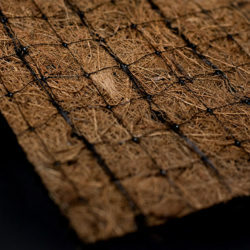 Extended term erosion control blankets are manufactured from natural straw, excelsior, coconut or a combination thereof. They also have photodegradable netting stitched on both sides. The blankets provide extended longevity while yielding protection for 24-36 months. 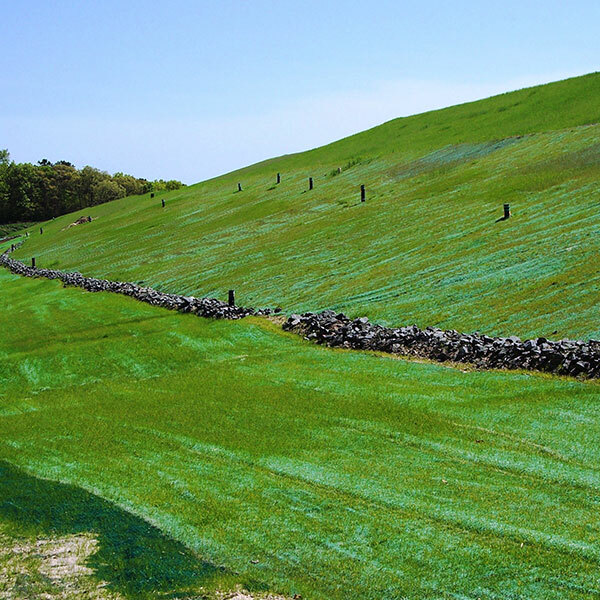 They are ideal for arid environments, steep slopes, channels or areas where vegetation establishes slowly. 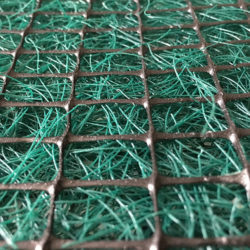 Permanent Turf Reinforcement Mats (TRM) are manufactured by processing UV stabilized, non-degradable synthetic fibers, filaments, and mesh nettings into a three dimensional reinforcement matrix. They are specifically designed for permanent and critical hydraulic applications where design discharges exert velocities and shear stress exceed the limits of mature natural vegetation. TRM’s also provide sufficient thickness, strength, and void space. This permits soil filling as well as retention and development of vegetation within the matrix. TRM’s are available in 8oz, 10oz, and 12oz weights. Don’t forget the staples or stakes. Contact our sales office at 609-971-8810 or check out our construction jobsite supplies section for options to secure your rolled erosion control blankets. We welcome the opportunity to be of service.